If you are looking at a house you’re thinking about buying; there are some easy ways to check if the sagging you see is the result of foundation problems. Then it’s up to you to decide how to proceed. Foundation issues can be scary, but they can be fixed. Look for settlement and heaving of the foundation of your house. This is a natural occurrence due to the type of soil underneath the house. Or evaluate if they are buckling in a concave or convex pattern. Another way to see a damaged foundation is through cracks in the walls of the foundation. While some cracking is normal, a “V” shaped crack which is wider at the top than the bottom is more of a concern. Additionally, if one side of the crack is offset or more pushed in than the other side, it could indicate that the foundation is rotating. Trees growing too near the house pose a risk to the foundation as well as the roof’s covering. Tree roots will grow through almost anything in their thirst for water, including a concrete foundation. Drainage – or the lack of proper drainage – can also severely affect your foundation. If a home’s gutters are chronically clogged, rainwater has no place to go but down toward the foundation. The result is pooling water causing erosion of the soil meant to support the foundation. This is called undercutting. Likewise, a flood resulting from a broken water line or natural occurrences can compromise your roof eventually. Two or more roofs on one structure spell trouble. The home may not be designed to support the weight of this extra roofing material, and it will sag. Additionally, if your roofer has used material that is much heavier than your previous roof, it can sag for the same reason. Cracked rafters and trusses can cause sagging. If your roof’s structure is unsound because of leaks or termite damage, you may start to see bowing in your roof. Occasionally, a house wasn’t engineered properly for the type of roof that has been applied. Or, something like a heavy air conditioning unit has been placed on a roof where it doesn’t belong. An overworked, untrained, or stressed building crew can compromise the structure of your roof from the outset by failing to make sure the structure is entirely level and straight before applying a roof, and this can result in a wavy roof at the end. 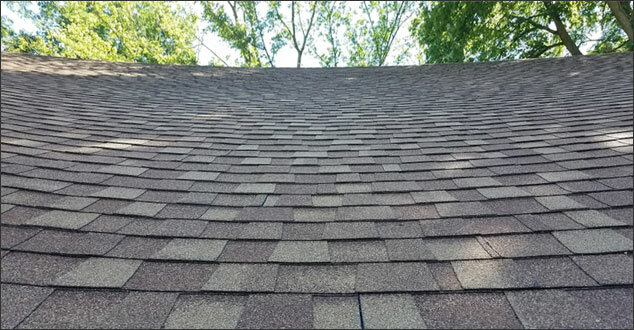 Ultimately, it’s best to get the expert opinion of a reputable roofing company to diagnose a wave, hump, bump or sag in your roof. Don’t buy a house without knowing precisely what the problem is. And don’t ignore one of these things happening to your roof. Make sure you take care of the issue right away. If you have any questions regarding irregularities in your roof, we would be thrilled to help. If you live in Southeast Michigan, please contact us today. Thanks for all this information. Whenever I used to see sagging roofs on old buildings, I usually assumed it was because they were old and – in general – there is nothing straight about an old building (haha). I now know that there are a few more things I should be keeping in mind.